If you're considering a kitchen remodel and space is a concern, you may want to give some thought to a one-wall kitchen design. Typically found in small homes, apartments or loft spaces, the one-wall kitchen works by keeping all appliances, cooking tools and ingredients within close reach. Here are some recommendations for single-wall kitchen designs, that will help maximize the area to its fullest potential. The single-wall kitchen is quite functional when designed properly. In this layout, cabinets and appliances are fixed on one wall, making it the ultimate space saver. With a kitchen spanning just one wall, a bit of clever space planning is needed to optimize valuable kitchen real estate. A common challenge in a single-wall kitchen design is the lack of counter and work space. 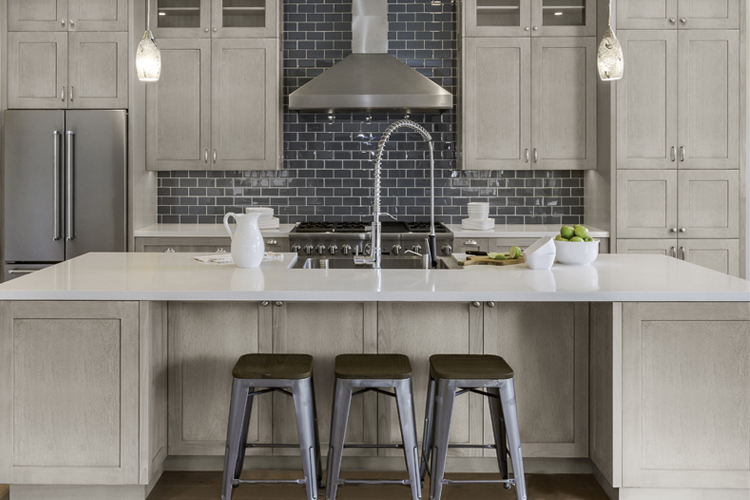 One way to increase the functionality of a one-wall layout is by adding a kitchen island or counter-height table to the design. Either of these two options will add an extra work surface to the kitchen, key for food preparation or extra seating for guests. Maximizing storage space is one of the most desirable features in any kitchen. With the compact design of the single wall kitchen, storage becomes an even bigger challenge. There are a variety of ways to ensure adequate storage space when cabinets are massed on a single wall. One straightforward approach is to add as many cabinets to that wall as possible. Tall upper cabinets, bridge cabinets, and creative use of built in shelving will help maximize space. Additionally, the use of an island (both permanent and rollaway) will help increase the amount of available storage. It is important to choose cabinets or shelving that don’t visually close off the area. Interior lit, frosted glass cabinets work beautifully to open the space while also hiding clutter. If you decide to use traditional cabinets, be sure to keep your finishes simple throughout, preserving clean lines and minimalist hardware. Even though a single-wall kitchen tends to be small, you can still include modern and attractive appliances. Many current kitchen appliances are specifically designed for small spaces. A compact dishwasher, oven, and fridge can achieve the look without compromising aesthetics and budget. With only one bank of cabinets and a solitary bench-top to install, the single-wall kitchen is significantly cheaper than the more popular common layouts. When dealing with space limitations, this arrangement greatly reduces costs and looks rather cool in an 'avant-garde' kind of way. While this layout can seem restrictive, you can always give it some extra life by adding unique materials. The money that you save from building a smaller space could allow you to get creative with your kitchen cabinet ideas, and maybe even splurge on top-quality counter-tops. While you’re keeping the design simple, you can still look for opportunities to accentuate your design with small pops of color in appliances, curtains, and art. It's important to remember that keeping the design simple doesn’t mean your one-wall kitchen should look boring. The main draw for the single-wall design is its wide-open layout, which can incorporate nicely into main eating or living areas, and put the cook at the center of the action when entertaining. This combination cooking and dining space is open, modern and unique, which offers a great solution for cooks who want to be in on the action. Do you have a single-wall kitchen? Has it adequately served you or do you wish for a different layout configuration. Tell us about it in the Comments section.